Although time has passed since the first post of this series, the pressing plastic problem has not changed. There have been some more highlights in the news, including the introduction of more freely available tap water throughout England to encourage water bottle refills and reduce purchases of single-use bottled water, as well as several other political promises made; but nothing legally binding yet. Blue Planet 2 did, however, receive an ‘Impact’ award at the National TV Awards which recognised the significant increase in environmental awareness both in the hearts of the nation and the Houses of Parliament, since its release. Carrying this impact with us, we press on in the quest to Say Goodbye to Single-use Plastic. Although part 1 was published after Christmas, I didn’t want to overload it with too much info so in this part 2 I’ll talk about some of the things that helped make my Christmas a little more eco-friendly – although there’s still a long way to go. Following my 5 things to remember at Christmas post we were then lucky enough to receive a restaurant gift voucher from one of our family members which, in my opinion, is a perfect example of a thoughtful, zero waste present. What better time for a discounted date night than January in the post-Christmas blues? 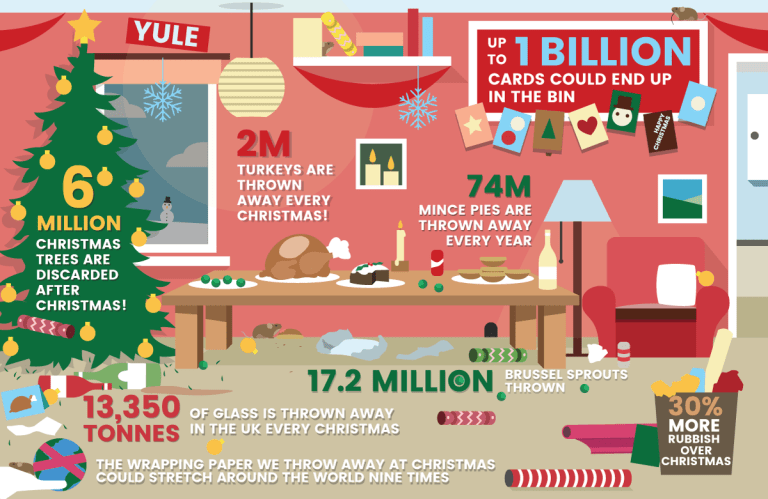 A shocking infographic showing the truth behind Christmas waste. Source: article by House Beautiful. One thing that became apparent whilst opening presents was the sheer amount of waste that wrapping creates, considering that a lot of wrapping paper cannot be recycled as it’s reinforced with plastic and/or sprinkled with specs of glitter – side note: have you ever noticed that you use glitter once and then it never seems to go away? Yep, it’s a very harmful micro-plastic for that exact reason. Biodegradable glitter has in-fact been developed by ecoglitterfun but it will cost you a pretty penny so use it wisely (or avoid glitter altogether). I would say sorry to all the festival go-ers but I know that I was one myself this past year and I know for a fact that I wore glitter on my face at Glastonbury (pictured). This just goes to show, however, that these little changes do require time and effort but aren’t impossible. A group of Nurseries in the UK even banned glitter all together in their efforts to protect the environment, good job! Personally, the next time I go to some such festival I’ll factor in the extra money for eco-friendly glitter – or even chip in with a friend. I digress; the point is that looking at the huge pile of spent wrapping paper in front of us, my family and I agreed next year to abolish it and use newspaper, bags, tissue paper and string or even a nice fabric instead. Better still, focus more on intangible presents that don’t require wrapping. As for eco-friendly presents, there were some handmade Welsh soaps wrapped in paper rather than plastic, several non-plastic kitchen bits including a bamboo chopping board, and a make-up removing cloth which, so far, has been my personal highlight and a real game-changer. My friend and I had this very conversation only a few months ago, wondering what we could do to eliminate the waste caused by our makeup wipes and cotton pads, yet here the answer was all along. There are a couple of different brands available now but mine is the Magnitone Wipeout and you literally just wet it with warm water and wipe (or rub) the make-up away (mine is very well used as you can see…) I was a little hesitant but it actually works a dream, even on thick eye makeup! I love it! Just goes in the wash with everything else when it needs a refresh. Outside of Christmas, one of the things I wanted to talk about in this post is washing up. In the first post I talked about my coconut hair, biodegradable scourer and since then I’ve made a few other changes to my washing up routine – or, at least, tried. In terms of ditching the sponge, that I have done. I’ve employed the use of microfiber cloths I already had but wasn’t using, for washing up and general cleaning in place of sponges and kitchen roll (which, by the way, isn’t always recyclable so I’ve ditched that too. Same goes for tin foil.) This works really well and I can’t complain, although I am conscious that this may be a plastic fibre issue to tackle at some point down the line… let’s hope not. As for washing up liquid, however, I was super keen to make my own after seeing several recipes online, as I talked about in part 1. When it came to it, sadly I’m not sure it made the cut (pictured above). In theory it’s a simple combination of soap, vinegar, water and some essential oils but in reality the lack of lather in comparison to the usual shop-bought washing up liquid made it hard to tell whether it was actually doing the job, and seeing my cutlery dry with soap spots was the final (non-plastic) straw for me. So unfortunately, we had to emergency swap back to normal for the time being, though we tried to pick one that’s supposed to last forever and ever until that annoying little kid on the advert wants to build his bloody toy rocket. At least he’s reusing. Moving home recently was another opportunity to seek out eco-friendly/non-plastic alternatives to things normally bought for the house, such as making sure I bought a metal rack for the draining board (as oppose to the many plastic options out there) and hunting high and low for a suitable, sustainable foot stool (we are short people, we can’t reach the top cupboards). The perfect little footstool was finally found in TK Maxx – see photo below; I wanted a wooden one with character that we could keep forever and ever and, seeing as my boyfriend loves orcas, that’s exactly what I found! Time for another DIY project: homemade antibacterial spray. Antibac wipes are yes, very convenient but not only contain plastic fibres like many other types of wet/makeup wipe, they also get flushed down the toilet (for some reason completely unbeknown to me; they are NOT ‘flushable’, the packaging lies) and cause all kinds of drain blockages, bursts, contribute to littering and even help form ‘fatbergs’ as we’ve seen in the news because they do not decompose. Anyway, I kept aside a spray bottle of old antibac that would otherwise have been recycled and made up my concoction. This one works an absolute treat: water, white vinegar, lemon juice, lavender oil, tea tree oil. That’s all there was to it! Wine vinegar is a naturally brilliant cleaning agent especially for stainless steel and glass, whilst lavender and tea tree oils are naturally antibacterial and add a little extra scent to mask some of the vinegar. My boyfriend still thinks ours smells too vinegar-y, but it’s only when you’re actually spraying and wiping it down, once dry the odour doesn’t linger. Personally I’ve been loving using this spray and would recommend anyone to try it at home, it’s so simple and so effective! And amazing to know that you’re only using natural ingredients so there’s no itchy skin from chemicals afterwards (no nasty testing on animals either!). Don’t be afraid to talk to others about this, not just friends & family but bars and restaurants. There are plenty out there looking to make a difference, which I’ll do a separate post about soon but The No Straw Stand is a good place to start. If you’re still just starting out on your plastic-reduction journey, here’s an article from earthyandy on some small, simple steps to get going. Do you have any advice on favourite eco-friendly products? 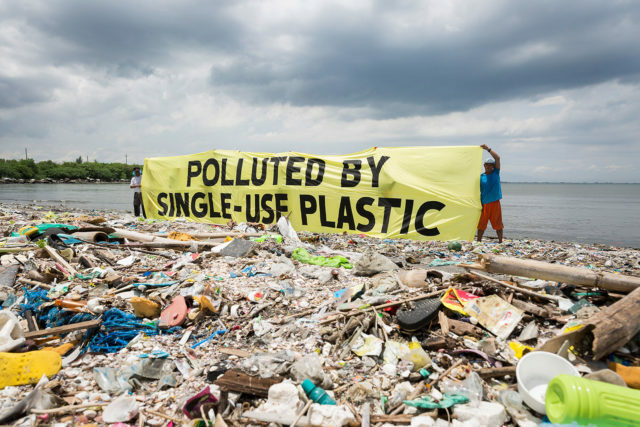 Have you been trying to cut down on plastic and live more consciously too? Stay tuned for more next time! (And if you haven’t watched Blue Planet 2 yet, seriously what have you been doing?! Catch up here). Note: none of the links in this article are sponsored. Source for Featured Image: Justin Hofman photography.